Unmanned Cargo - Walmart Joins the Delivery Drone Race! Walmart Joins the Delivery Drone Race! The physical retail giant Walmart has applied with the Federal Aviation Administration (FAA) to test drones for several purposes such as home delivery, grocery pickup and warehouse inventory management. To complement their “vast network of stores, distribution & fulfillment centers and transportation fleet” with a drone flotilla to better expand their commercial reach. After all, “there is a Walmart within five miles of 70 percent of the U.S. population, which creates some unique and interesting possibilities for serving customers with drones”. Taking into consideration current drone technology limitations, it is most likely Walmart will begin by using their drones for inventory management outdoors. These drones (likely based on the DJI Phantom 3 Professional series) would fly around Walmart’s distribution center parking lots and take stock of trailers via electronic tagging (to detect inventory still packed inside their containers). Alternatively, the drones could make visual scans of the inventory inside a typical Walmart million square foot (92,900 square meter) distribution center. The technology employed in this case would likely be similar to the tech employed by South African inventory management startup – DroneScan – which uses UAVs to scan barcodes that would normally be too difficult to reach for humans in a typical warehouse environment. However, Walmart does seem to have other more ambitious plans for their drone fleet. One example is the area of grocery pickup service which Walmart currently offers in 23 markets with plans to expand to another 20 markets in 2016. As per their FAA Section 333 application, test flights would confirm whether drone package delivery to a pick-up point in store parking lots is feasible. 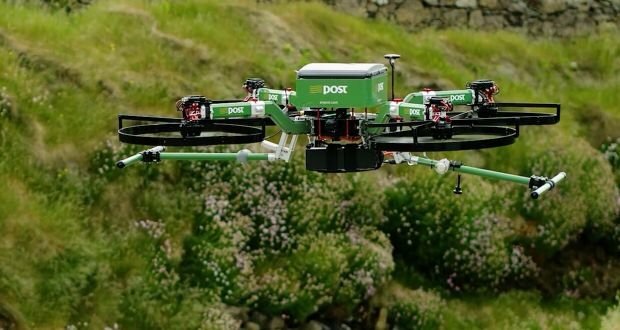 Given that they currently offer to load the groceries into the customer’s car, it is not hard to imagine drones potentially delivering directly to the back of the car. It would require a lot of technology and coordination but DHL is already testing the basics of allowing their drivers to directly open recipient’s car trunks. Home deliveries are also another alternative. The Walmart concept involves testing home delivery in small residential neighborhoods after obtaining permission from those living in the flight path of the delivery drones. Their FAA application implies the use of truck deployed delivery drones similar to the Horsefly concept. Not yet defined. It is speculated it will be a variation of the already existing DJI S900 UAV systems which retails for US $1,400 on Amazon currently. If it is based on the DJI S900 drone, payload is likely to be limited to parcels under 5 kg (11 lb). Range will likely vary on specific Walmart specification requests. The official DJI site estimates that the DJI S900 drone has a max flight time of 18 minutes on a breezeless day with a payload of 6.8 kg (15 lb) hovering at a height of 2 m (6.6 ft). What are your thoughts on this Walmart delivery drone concept? Comment below!